A close-up view of "Block Island," an odd-shaped, dark rock, which may be a meteorite. The rock was imaged with the navigation camera on NASA’s Mars Exploration Rover Opportunity on sol 1959 (July 28, 2009). NASA's Opportunity rover has eyed an odd-shaped, dark rock on the surface of Mars ? scientiststhink it could be a meteorite. Opportunity'shandlers spottedthe rock, which measures about 2 feet (0.6 meters) across, in images sentby the rover on July 18 in the opposite direction from which the rover wasdriving. The rock, dubbed "Block Island," is unusual for its size, missionscientists said. "Theimages came down after we had already passed," said planetary scientistAlbert Yen of NASA's Jet Propulsion Laboratory in Pasadena, Calif.
Mission managers decided the rock was wortha closer look and had the rover then backtrack some 820 feet (250 meters). Over theweekend, scientists used the rover's alpha particle X-ray spectrometer to get compositionmeasurements and to confirm it was a meteorite. "It'spretty clear now that it is," Yen told SPACE.com. 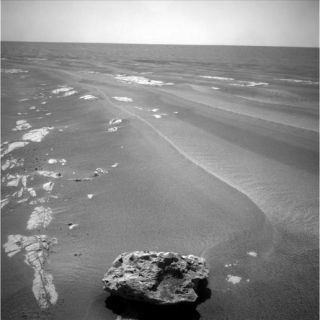 The rockhas a similar composition to anothermeteorite that Opportunity found in Jan. 2005. That meteorite was the firstto be found on another planet. It was lying just over half a mile from itslanding site in Mars' Meridiani Planum. Since landing on Mars in 2004, Opportunity has driven across 10.7 miles (17.2 km) of the red planet?s surface. The 1-foot(31-cm) diameter slug of iron and nickel gained the moniker "Heat-ShieldRock" due to the rover's discarded heat shield having come to rest only 20feet (6 meters) from the meteorite. There aresome differences between the two meteorites though and scientists plan to usesome of Opportunity's other instruments to learn more about Block Island. "We'relikely to spend a good amount of time here," Yen said, at least throughthe upcoming weekend. The roverteam has also taken color and microscopic images of the meteorite. Next up aremeasurements with the rover's M?ssbauer spectrometer, which can tell scientistsmore about the mineralogy of the rock. Studyingthe meteorite could tell scientists more about the surface conditions in placewhen the meteorite fell: The pitted surface of the rock shows millimeter-sizedgranules of what scientists think is hematite, which suggest the meteorite wasonce buried under the Martian sand, Yen said. The meteorite could also tell thescientists about the atmosphere at the time, since the chunk that is left isrelatively large. Opportunity and its sister rover Spirit havebeen rolling along opposite ends of the red planet for more than five yearsnow. While Opportunity passed the10-mile mark, Spirit has been mired in a Martian sand trap for more than amonth. Rover engineers back on Earth are working with a test rover to come upwith ways to free the mired robot. In its fiveyears on Mars, Opportunity has spent two years exploring Victoria Crater,revealing that the whole region the crater lies in was likely shaped by waterand winds that blew up huge sand dunes. Its twin Spirit is on the other side ofMars in a region known as Gusev Crater.